We just bought a beautiful blue male Betta fish the other day and we named him Sunny. I thought he would be a great addition to our animal family and we could learn a little about Betta’s. Here are a few highlights about Betta’s. Male Betta Fish are beautiful and relaxing to look at. Here is Sunny our new family addition. Betta fish are sometimes called Siamese Fighting Fish but the more peaceful name of Betta seems to be the more popular term for these beautiful fish. Betta fish originally lived in the shallow rice patties and bodies of water in Asia. They are quite territorial and can be very aggresive so one per pond was enough. They will puff or fluff out when they see another male and may fight to the death. For this reason it is best to only keep one in a habitat at a time. 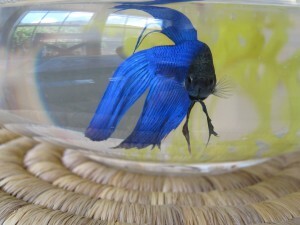 if taken care of properly Betta’s can live for several years and I’ve seen reports of up to 5 yrs. do you have any tips to add about Betta care? We are enjoying Sunny and are learning a little more about him. His color has changed quite a bit since we got him. When he arrived he was in a little cup with blue dye to enhance his colour. We changed this right away when we put him in his new home and his color went paler but then has come back to a rich beautiful blue. I will write later about what Sunny had to say in an animal communication session with him. Can you guess what kind of music he likes? Maybe when he was at his breeders they played this type of music a lot. Do you have any Betta fish stories to share?